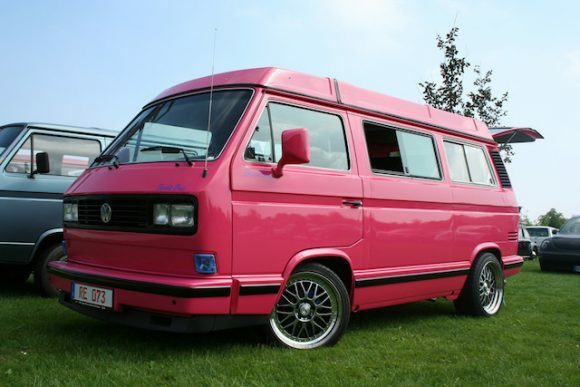 What would you name this hot pink Vanagon? 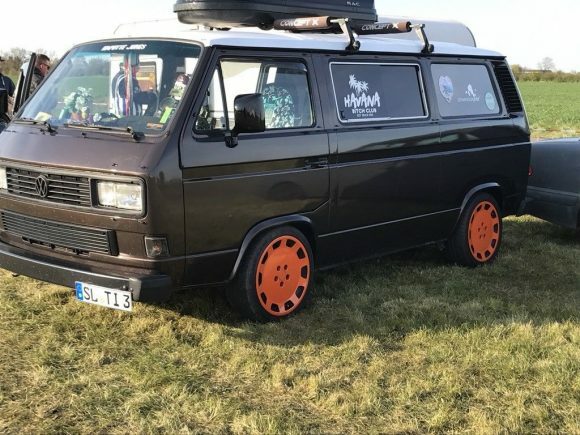 The owner slapped the name Babe Bus on it but it’s not exactly a bus is it? I guess Babe Vanagon doesn’t have the best ring to it. Check out the blue tinted signal lens that matches the logo perfectly. Nice detail. 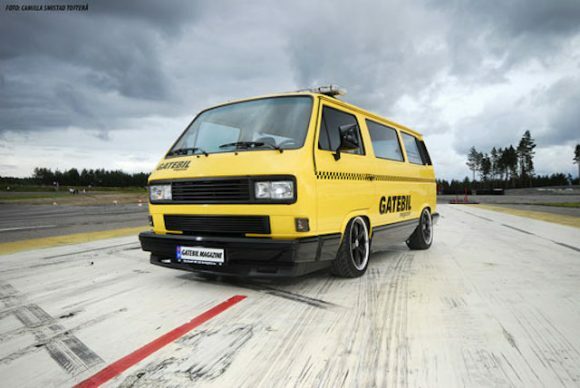 This Gatebil Magazine themed van reminds me of the old yellow cabs in NYC. This one looks a lot better than any yellow taxi I’ve ever seen, but it could be called the Yellow Cab Vanagon. Click through for another pic. 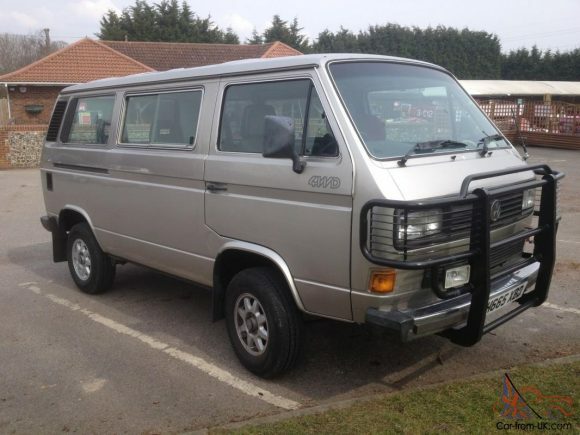 This otherwise average looking Syncro has a massive bullbar installed on the front bumper. It doesn’t appear like this van is used in the dense forrest, but perhaps they owner just likes the look. 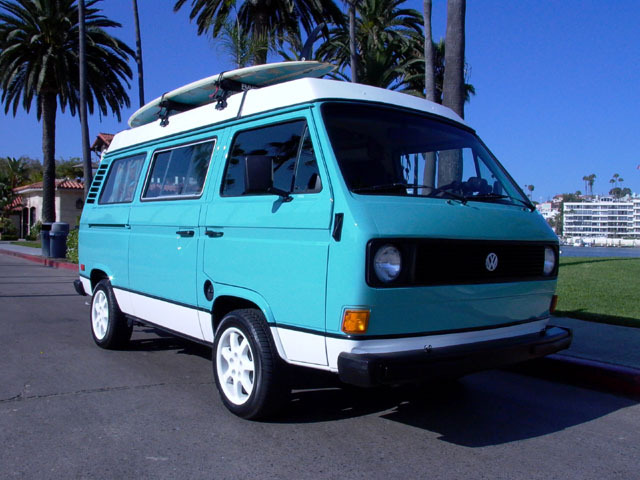 This 1981 Volkswagen Vanagon Westfalia by Eric Rankin looks as good as new. In fact, it looks better than new. 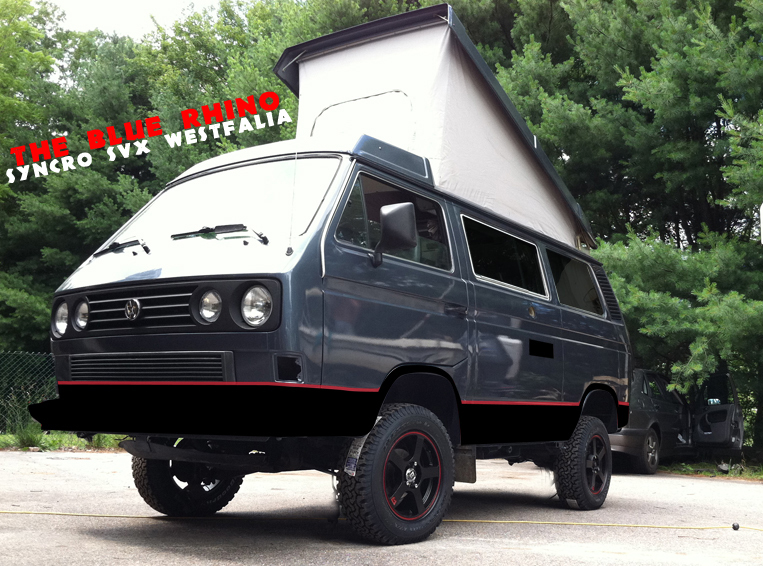 With a gorgeous paint job, custom wheels, and custom upholstery, this one is to die for. 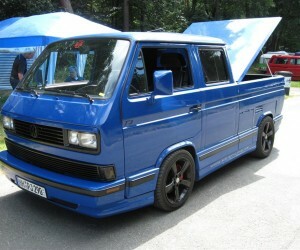 All chrome, (bumpers, window trim, etc.) painted black. Custom Ronal 16”x8” “Joker” wheels painted Snow White. VDO gauge cluster with tach, temp, oil & volt gauges. Wet Okole neoprene seat and bench covers. Kenwood stereo with Serius-enabled tuner and iPod hookup. 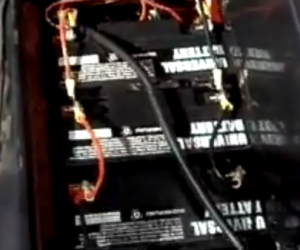 Secondary house battery with charging relay. Center Console storage for Absorber, binoculars, pens, paper. Custom Sunbrella fabric curtains, pillows and dash cover. Split-cushion rear portion of lower bed (for easy storage). Bamboo floormat from Bali. Beanbag ottoman from Tijuana. Yackima roof rack with artificial gutter mounts. Slide-out hitch receiver and tilt-up rear storage rack. 2 folding bikes stowed on storage rack. 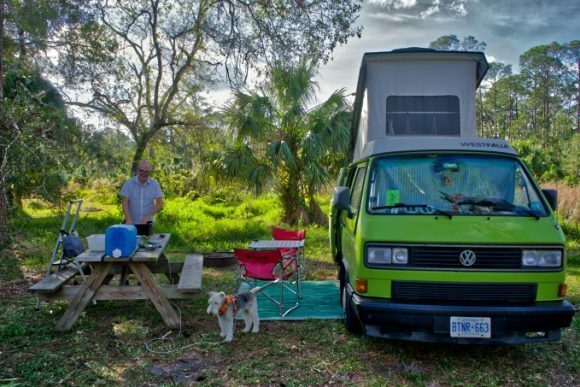 Click through to see more pictures and a very nice custom interior! 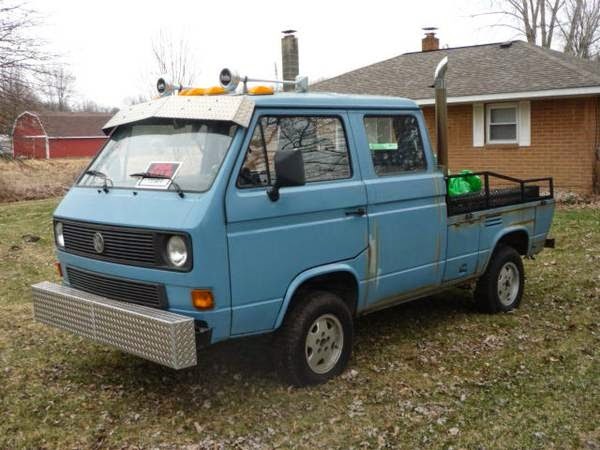 This 1990 double cab Syncro was for sale recently in Saginaw, MI. It has several homemade hacks including the diamond plate bumper and sun visor. 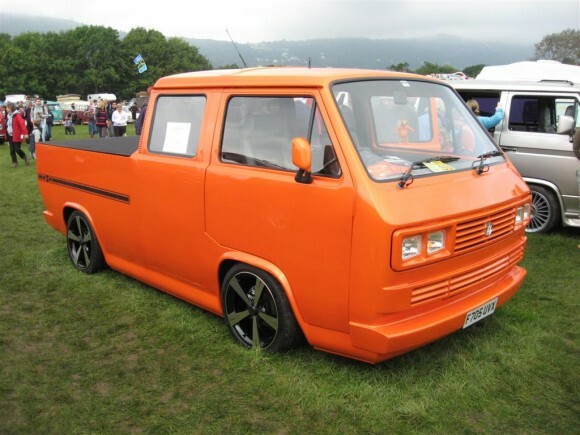 This Doka has a Subaru engine so there is plenty of power. The rear folding bed slides are gone in favor of a homemade bed, but it also features truck exhaust and roof mounted horns. 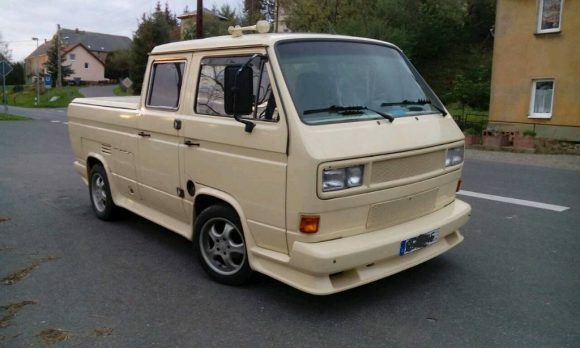 The seller was asking $10,000 on Craigslist. Click through for another pic.